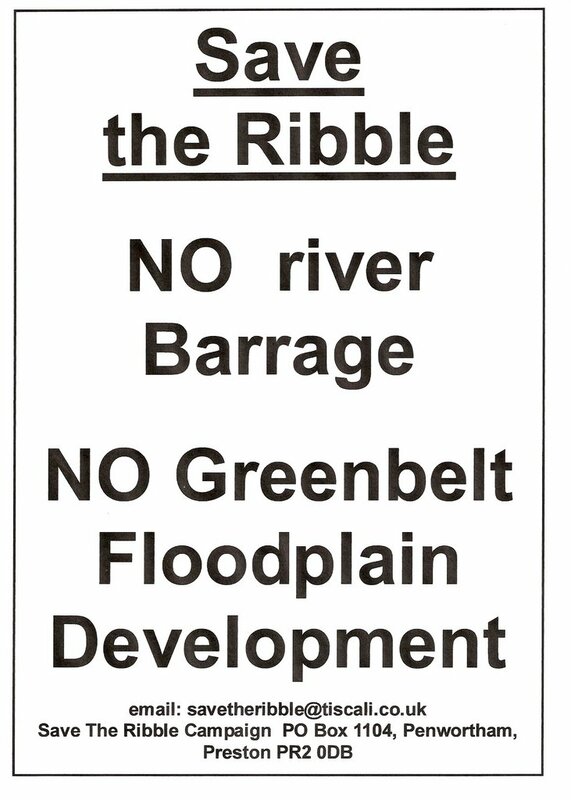 It's 2007 already, and Save The Ribble intend it to be a year where there is NO barrage built in the River Ribble, and no more housing built in it's floodplain. 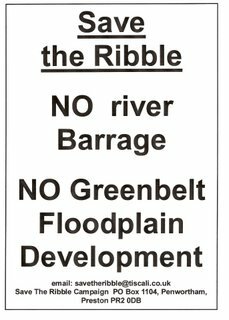 We hope that if we can get enough people to stand up for their river and the greenbelt in the Central Lancashire City Consultation then we will be able to guarantee that these threats to local people and the environment are totally ruled out at least until 2027, we want the Ribble Floodplain to be guaranteed as a green breathing space for City and Country dwellers alike in the forthcoming Local Development Frameworks. Some people have accused us of saying that the Riverworks barrage and housing schemes are a 'foregone conclusion' - this is a ridiculous allegation, without even the slightest bit of logic. Indeed, what would be the point of our groups existence if we believed this to be true? Campaigning against a barrage that is a foregone conclusion would be like spending the day campaigning against the sunset. It is precisely because the barrage and housing ideas are NOT a foregone conclusion (yet) that our campaign exists - we want to prevent them from becoming a foregone conclusion. The opposite idea, that the Riverworks barrage and housing development is just a 'pie in the sky' planners' whim that will never happen is just as pernicious - a lot of people in Cardiff thought this about the Cardiff Bay Barrage development, and now they are spending £20 million a year on dredging and pumping out groundwater to prevent flooding due to the consequences of that particular barrage. The truth currently lies somewhere in between - and the more of us that stand up and point out what a dangerous and irresponsible idea a Ribble barrage scheme or a floodplain housing development actually is, the less likely it is that it will ever happen and the more that local peoples' views will be listened to - but if we sit back complacently and leave it to someone else to do the protesting, the more likely it is that greedy developers and concrete-obsessed planners will get their way. We feel that in many different forums and bodies, the tide is just beginning to turn against the barrage and housing ideas contained in Riverworks. We hope to bring more news about this very soon. 2006 saw similar barrage and housing schemes in other areas rejected due to the flood risk they posed. We also intend to publish more articles in 2007 explaining exactly why the Barrage and Housing Schemes increase the risk of flooding to local people, and their potentially disastrous consequences for the local environment, particularly the 250,000 birds of the Ribble Estuary. 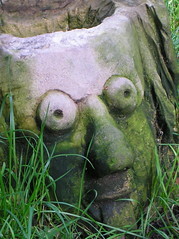 We also hope to publish more of your wonderful photos, and more local people's views about their river, their local football pitches, green spaces and allotments. 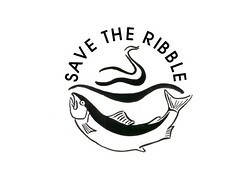 By publishing such great photos of our river, and information and artwork about the beautiful countryside that surrounds it, our blog is helping to promote the beauty and ecological significance of the River Ribble to a national and international audience, so why not make it your resolution to post us your comments, send us your ideas and articles, join our campaign and help us to turn pro-Ribble voices into an irresistible tide in 2007!